“We literally ran out of hamburger buns and patties within the first two hours. We were ill-prepared for this amount of traffic,” said McDonald’s franchisee owner William Cosgrove. “We had to pull in supplies from the local Costco who was able to meet our needs.” With McDonald’s lunch menu starting at 10:30 AM, employees say a line began to form around 9:45 AM that went around the building and across the parking lot. 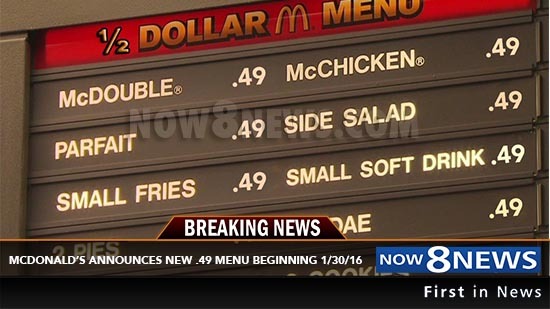 Cosgrove credits the new “Half Dollar Menu” for tripling his sales revenue for the day. A spokesperson for the McDonald’s Corporation, Cynthia Whitley, says they plan to bring the McDonald’s brand out of the slump it has been facing for the last 2 years. Whitley assures customers, “Our all beef patties will not be compromised due to the decrease in price. We will continue to provide quality animal products raised in humane environments while providing an affordable option to our customers.” Get ready, the new “Half Dollar Menu” will be served at all U.S. locations beginning June 30, 2016.